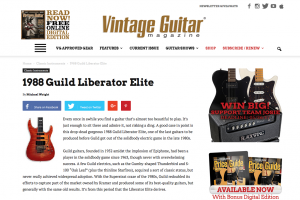 The subject of this review is a guitar that I’ve lusted after for years, namely the Guild Liberator Elite. You see, one of my favorite guitars is a Jackson Archtop that I’ve played so much that I want another arched top super-Strat, but that’s a pretty rare thing to come by (at least for US-made Jacksons) so when I discovered that Guild made one, I had to have it. The only problem was that they didn’t make very many of them and they don’t come up for sale very often, so I had to wait. I don’t wait well, but waiting was my only option so after a couple of years of doing so I finally scored one of these rare beauties and had a chance to run it through its paces. I normally fill my introduction with information about the guitar, what the world (well, the US) was like during the years of its release, and maybe a personal anecdote about why I like the model. The only anecdote I’ve got is that I like this guitar because it’s pretty. Well, I have got a thing for arched-top super Strats because one of my favorite guitars is a Sam Ash special edition of the Jackson SL2H which is just such a beast. 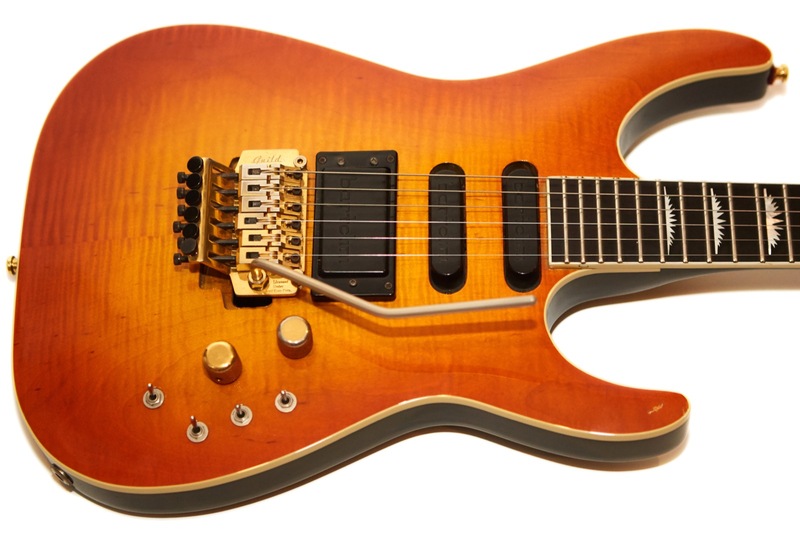 You’ll see me compare this guitar to it throughout the article, but I never owned one of these Liberator Elites in the past and I didn’t lust after one back in the ’80s, likely because I had no idea that it even existed until I became a collector around 2010 or so. 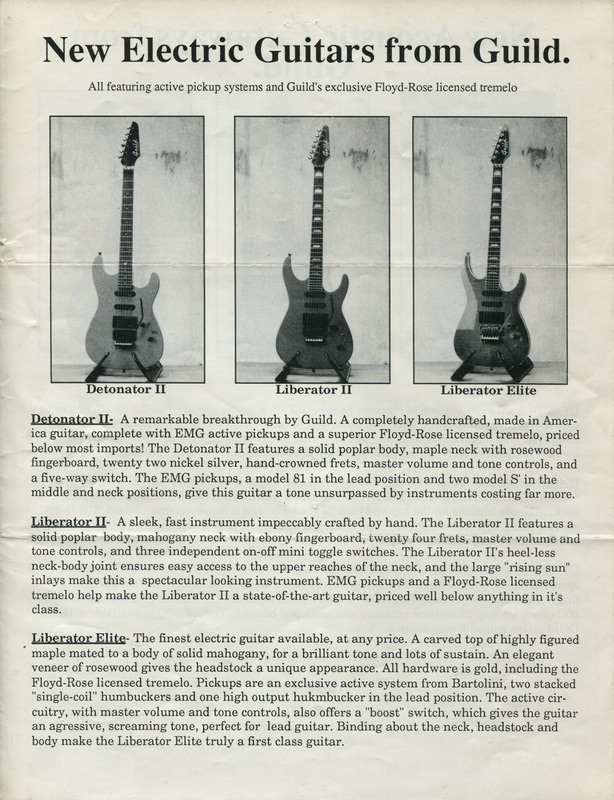 The problem I had when researching this guitar is that there really isn’t much out there in way of supporting documentation for 1988 Guilds let alone the Liberator Elite. 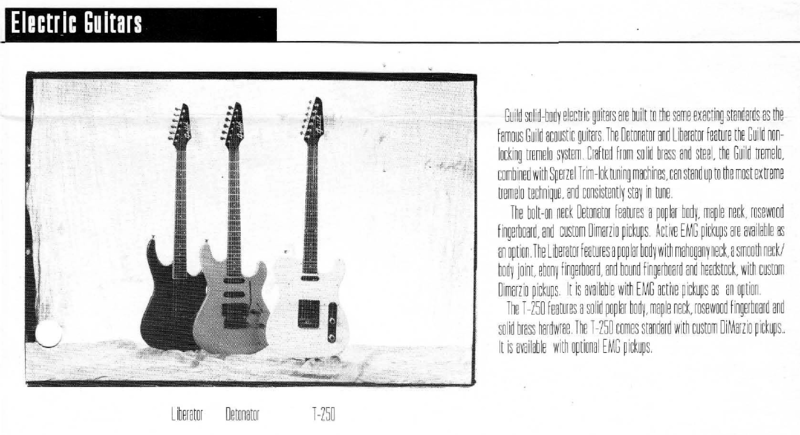 About the closest I came to a catalog was a scan of a 1988 flyer from Guild that shows the Liberator, the Detonator, and the T250, but not the Liberator Elite. 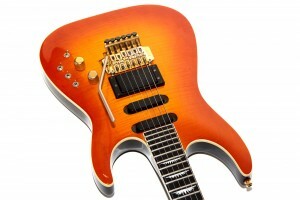 There are some pictures and even a youtube video of the guitars, but nothing concrete from the company itself. I’m sure Hans Moust knows, but I try to respect the fact that he’s one of the few people that does and that he’ll likely release that information in his next book so I’m not going to ask him only to publish it myself. I did discover an article in Vintage Guitar Magazine from February, 2004 that had a little bit of information, but nothing like the detail I was after except, perhaps, for this tidbit about the company itself: “In ’88, the Guild Musical Instrument Corporation defaulted on bank notes, went into Chapter 11 bankruptcy, and stopped solidbody production.” That may very well explain why it’s so hard to find marketing content from Guild for this time period as it seems they may have been in a bit of disarray at the time. I have no idea if the information is accurate, but I also have no reason to doubt it, so I simply take it at face value until Hans publishes his next book. 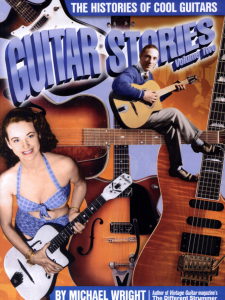 For what it’s worth the company history is corroborated in Guitar Stories Volume 2, but for all I know that was the source of the information in the article. During my research for this guitar I bought Ted Beesly’s book on Guild guitars which I had to source from eBay since it’s long out of print. My purchase paid off (that’s sarcasm) when I discovered the one line of text about the Liberator Elite as an addendum to the small section on the Liberator (page 78). It did show the list price, though, which was $1,860 in 1988. Then I talked to Kurt over at The Guilds of Grot and scored a copy of the 1988 price list which shows the price at $1,695. Once again I was faced with conflicting sources when it comes to vintage Guilds, but given the two choices I decided to believe the price list from Guild. If you haven’t been to Grot’s Guild museum online, I encourage you to check it out, especially if you have even a passing interest in Guild guitars. If you think I’ve owned or played a lot of Guilds, trust me when I say that I’ve got nothing on Kurt who owns just about every rare Guild that’s ever been made. When it comes to Guild electric guitars, he’s one of the few people that can make me jealous. I’ve seen a bunch of posts online claiming that Guid only made nine of these, or that they only made a couple dozen. I asked Hans about that and his response was “a lot more than a dozen” were made so unless you read it from Hans’ next book, take any such claims with a grain of salt. They are definitely uncommon, but it’s not like there’s only nine of them. 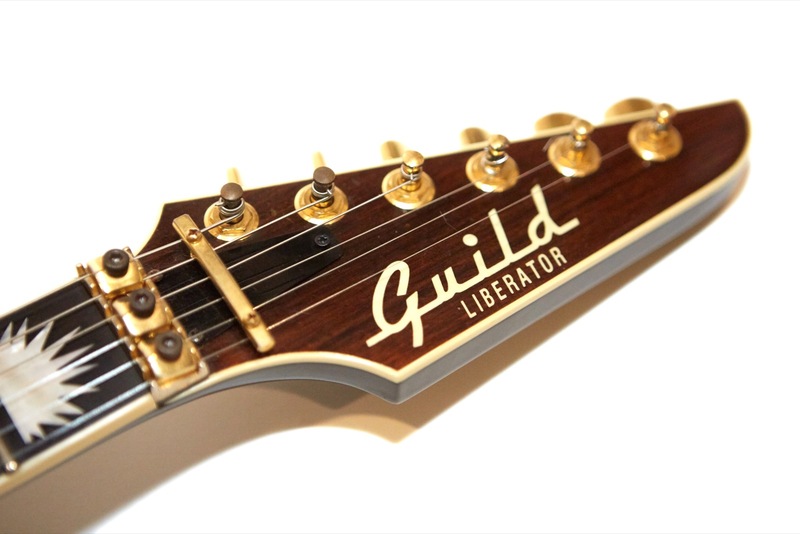 The Guild Liberator (not the Elite) was introduced in 1987 and for decades I had no idea that they existed or that I wanted one. 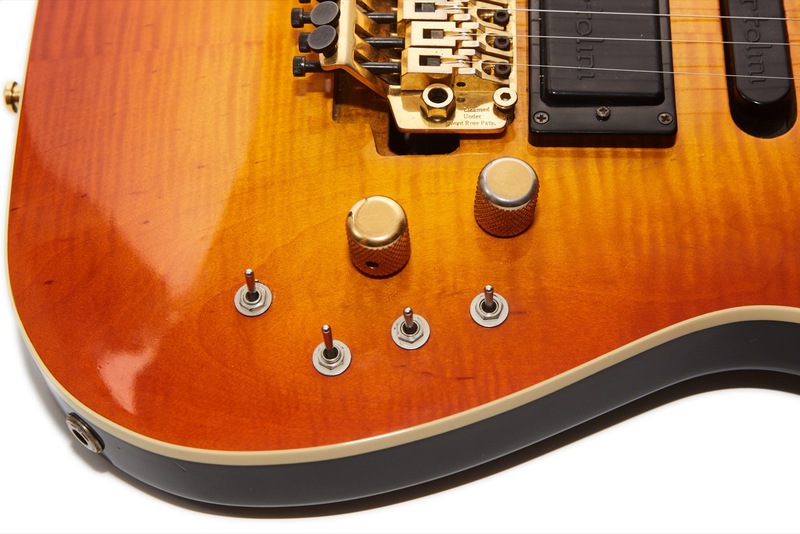 The Liberator is similar in shape and design to the Elite but does not have the arched top, the rising sun inlays, or the locking nut, instead favoring dot inlays and locking tuners. 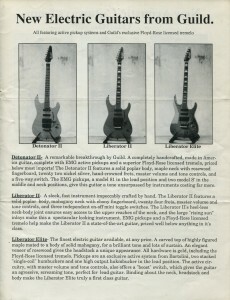 The Liberator II was released in 1988 alongside the Elite and came with Guild’s “exclusive” Floyd Rose licensed tremolo and the rising sun inlays. 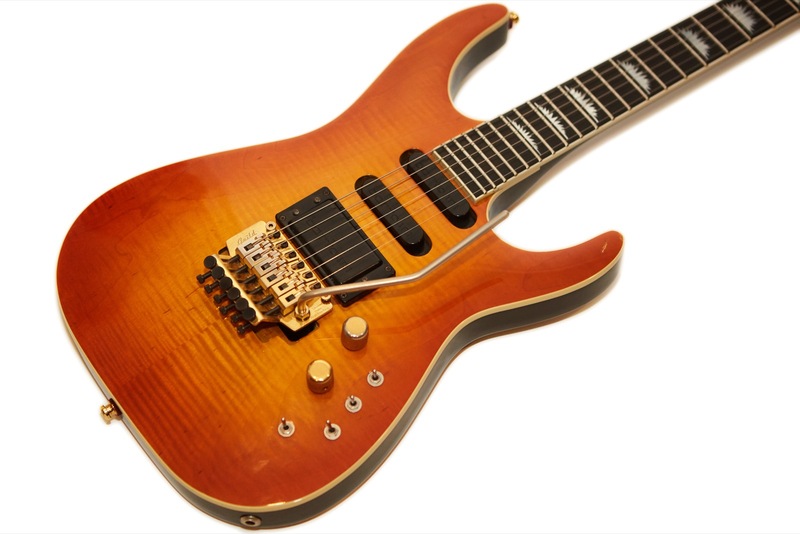 The earlier Liberator came with more traditional Dimarzio pickups with EMGs as an option while the Liberator II came with EMGs standard. I’ve only ever seen a couple of Liberators in my travels and I’ve never seen a Liberator II in person, but from playing this Elite, I now want them all. Notice in the tri-fold mailer (Thanks to Grot!) 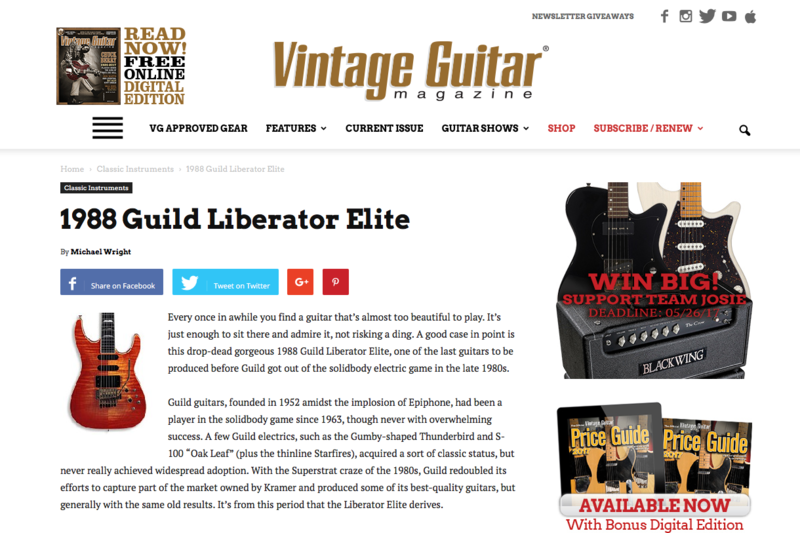 entitled “New Electric Guitars from Guild” it describes the Liberator Elite as “The finest electric guitar available, at any price.” I’ll be coming back to that bold statement a little later, so tuck that little bit of marketing hyperbole in your memory for a bit. I should point out that the Guild Liberator Elite is so cool that it’s included on the cover of Guitar Stories: The History of Cool Guitars Vol. 2 by Michael Wright which is also out of print as of this writing. I had to score my copy on eBay but I didn’t mind because I needed to add a copy to my collection of Guild stuff, anyway. Sadly, though the Liberator Elite made the cover in glorious color, there’s only a small paragraph regarding the guitar in the book, so once more I was pretty much out of luck. Before I continue I need to point out that this is one of the longest reviews I’ve ever written and that’s largely because there is a lot going on with this guitar, all of which needs to be covered because as hard as I tried, I could not find any details about this model anywhere else out there. As always, I tore the guitar apart, documented every little detail and laid it all out for the world to see in this treatise comprised of just over 7,500 words which is almost twice my normal length for a review. I believe this guitar is finished in Poly though I have little proof and frankly don’t care. The finish is beautiful and there’s only one issue with it and that’s that it got a gouge on one of the horns at some point in its life. Bummer. This guitar is a very nice amber burst which based on my research of Guild Nightbirds and other higher-end guitars by Guild, has to be one of their favorite finishes. According to the mailer shown above it came in Amber and Cherry Burst which makes me wonder which finish this one actually is. I’ve seen some that are far more red than mine, and Grot’s (which is known to be amber burst) is paler than mine, so I’m not sure if mine is faded cherry or dark amber. The best word to describe it is orange, so I think I’m going with amber. This guitar also came in a Transparent Charcoal finish which you can see in this youtube video. The headstock on the Liberator Elite has an “elegant veneer of rosewood” which gives the guitar a “unique appearance” (marketing phrases, those). This guitar has a nice book-matched flamed maple top that shows through the finish quite nicely. 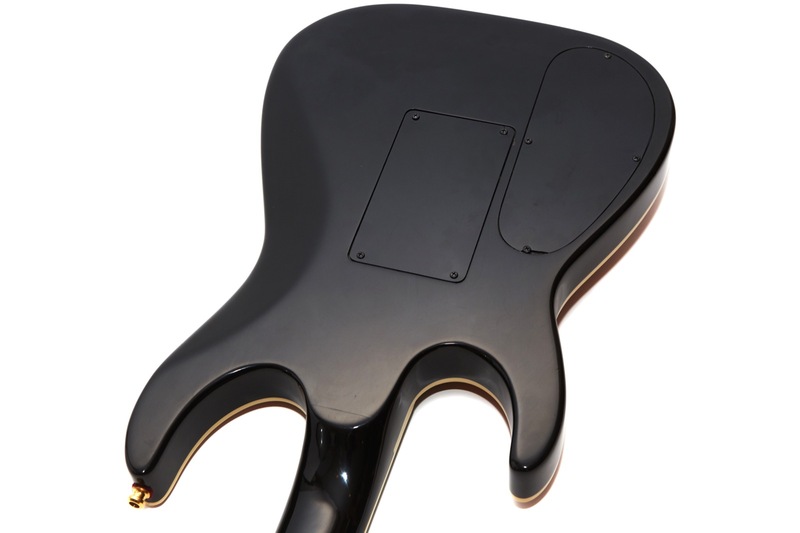 The body of the guitar is mahogany and the back is finished in simple black. 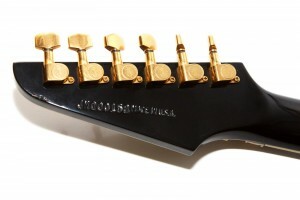 The headstock shape has a distinctive sort of “cake knife” look to it which I have to say I really like. It’s very distinctive and looks very rich with the rosewood veneer. 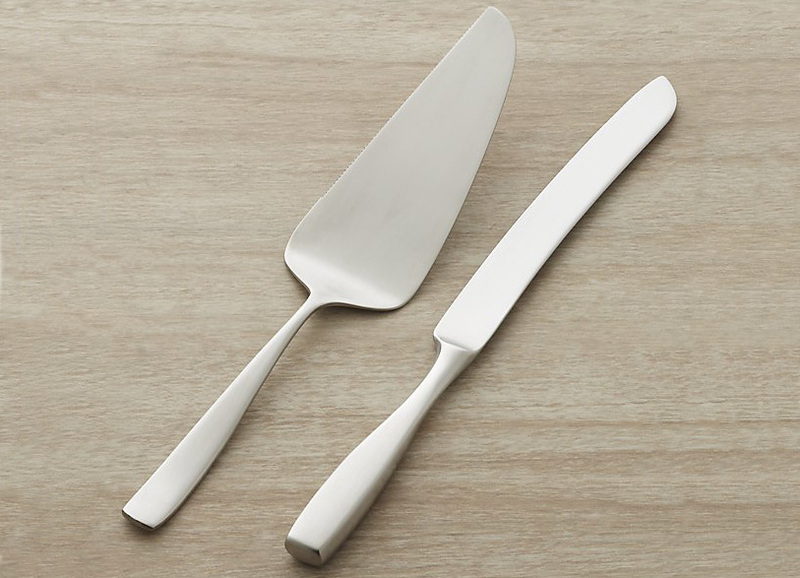 By the way, if you don’t know what a cake knife is, don’t worry because apparently you’re not alone. 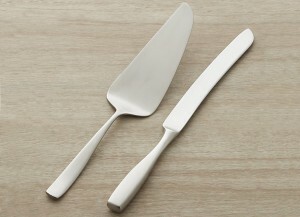 When we in the US use the term cake knife, we’re talking about the implement to the left in this picture which is used for cutting and serving cake. Hence, cake knife. I had considered going out and buying a big cake smothered with frosting in order to take a picture of me holding the guitar over the cake and maybe even dipping the tuners into the frosting, but then I realized that I’d probably eat the entire cake afterwards and thought better of it. This guitar has a scale length of 25 5/8″ which is a little unusual for a Guild electric, most of which have the more Gibson-like 24 3/4″ length. This is a super Strat, though, and Strats have longer necks which is a big part of the Stat sound. That jangly sound is absolutely present in this guitar so I’d say mission accomplished in that department. Now, when I say “most Guild electrics”, that was really only true until the ’80s when they embraced the super Strat movement during which a whole pile of guitars came forth sporting these longer necks. This is a 24-fret guitar so you can hit the highest of the weedly-weedly notes while abusing that Floyd Rose bridge in a manner unbefitting a gentleman, though this guitar was made in the late ’80s when bands like Poison and Mötley Crüe were not only wearing spandex but a liberal application of makeup, so I suppose the whole concept of gentlemen was rather in flux at the time. The fretboard is bound ebony and is masterfully crafted. 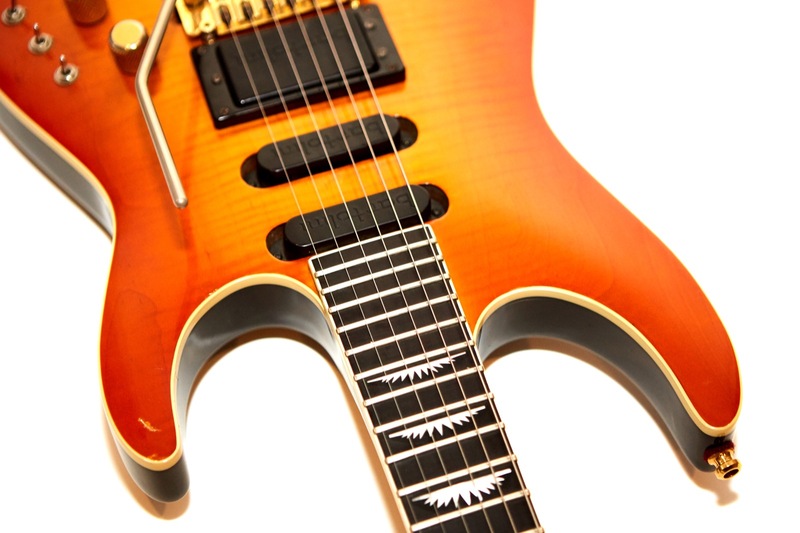 The inlays are likely pearloid though may be something nicer considering the high-end nature of the gutitar. They are in a very distinctive rising sun pattern that I’ve not seen anywhere else, though according to the docs I included above they were also used on the Liberator II. The inlays are really very well done and there are no rough spots on any of them, though you can see the outline if you look closely. No one is looking closely when you wear that much spandex and have that much hair; you’ll just have to trust me on that one. The frets measure at the typical .100″ wide by .03 high making them the same medium jumbos so common on Guild electric guitars. The width at the nut is 1 21/32″ which is halfway between 1 5/8″ and 1 11/16″. The fretboard radius measures at 20″ which makes it very flat, even for a super Strat. 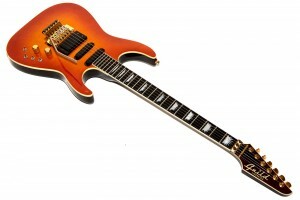 I rather like the neck as it reminds me of my favorite Jackson, though the Jackson is a bit wider. The fretboard looks and feels great and the frets are smooth and well finished though I think the neck has gone through some shrinkage or the frets need to be redone because I had some problems with strings catching that I’ll cover in the Playability section. Most super Strats I’ve played have big jumbo frets, but I’ve played so many Guilds over the years that I easily adapt and these don’t bother me at all. 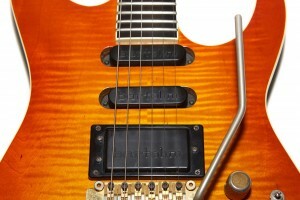 A hard-core shredder who is used to jumbos would likely think that these frets are too small. The set neck is installed at a very steep angle for this type of guitar. On my archtop Jackson, the neck is more or less parallel with the top of the guitar (zero degree neck angle). On the Liberator Elite, it is not. The neck on the Liberator Elite actually angles down and away from the top of the guitar which leads to what I consider to be a pretty big issue for the Floyd Rose which I will cover later. Now, a neck angle can be a good thing if your bridge is high, but in this case I think the bridge is high because of the neck angle and I can’t imagine why someone thought this was a good idea. My Guild S-281 from the mid ’80s has a pretty non-existant neck angle, though that’s got a Kahler bridge and a very flat top. My similarly equipped Guild S284 Aviator has maybe a 1° neck angle but it also has a Kahler. I think the combination of the Floyd Rose and the arched top just confused someone somewhere along the line during the design stage of the guitar. 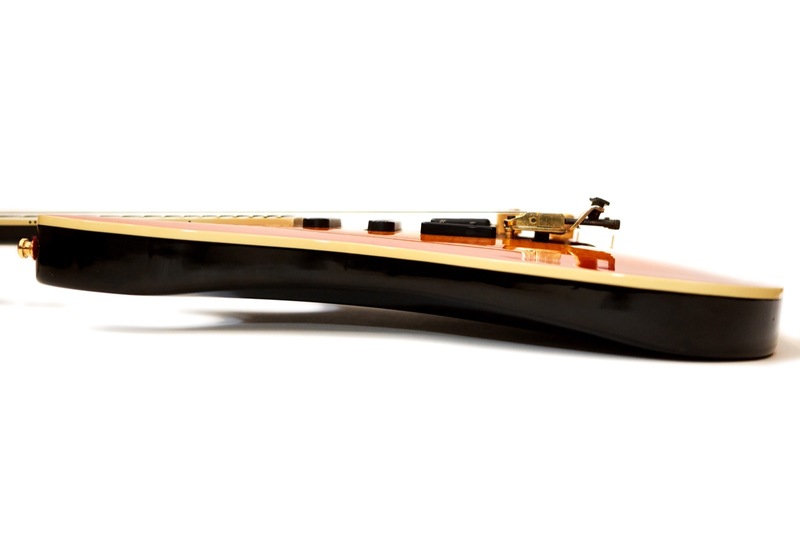 If you look at a Les Paul, they tend to have an optimum neck angle of about 4° but can vary from about 3º to 5º. This guitar has a neck angle of 5.5º which is pretty damn severe. Perhaps the idea was to make it like a Les Paul while also making it like a super Strat? I mean, it’s a Strat-shaped guitar with a mahogany back, carved maple top and set neck, so… maybe? My annoyance aside, this is a problem when shopping for a case since a case without proper neck support for this guitar is just asking for a neck break during shipment. Mine came with a non-original case but the previous owner packed it so well that it was not an issue. 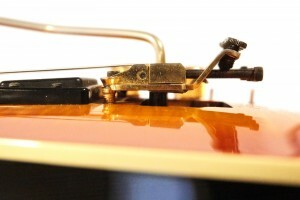 Beware if you buy one — check the case and ask the seller to support the neck near the joint and to loosen the strings before shipping. Similarly, take a good look at the neck angle in that picture and imagine what would happen if the guitar were to fall backwards onto the floor. The headstock would hit first which I imagine would result in a very Gibson-esque headstock break so, if you own one of these rare beasts, don’t let that happen. This is a very well-built guitar for the most part and it feels like one when you pick it up. While reviewing this model I also had a Guild S-281 Flyer in my possession which is a much lower-model guitar and the difference is immediately noticeable to this old rocker when I pick up the 8 lb 2 oz Liberator Elite. The binding is beautiful, the inlays are beautiful, the wood on the top is beautiful and everything about the guitar just exudes quality. Everything, that is, except for the Floyd Rose which I’ll cover in the hardware section. The quality of the Floyd Rose aside, the installation of the Floyd Rose is what I’ll cover here, and that is of dubious quality as well. It’s almost like the guitar was routed for a Floyd Rose without talking to the guy who attached the neck so they just bolted the damn thing in to make it all work. The neck angle is pretty severe which makes the Floyd Rose sit very high which feels down-right unnatural to this super-Strat lover. I’ve owned a fair number of meticulously hand-crafted Custom Shop Jackson guitars along with a few factory models and even the import Sam Ash model SL2H that I used in the neck comparison, and the Floyd Rose installations on all of them were just perfection. This thing looks like it was bolted on by a sloppy teenager in a high school shop class. You know, the shop class where they build the finest electric guitar available, at any price. 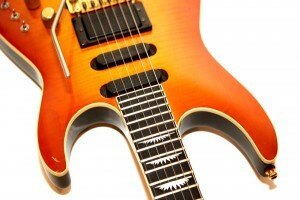 This is really a beautiful guitar aside from that damn import Floyd Rose piece of crap (oops – I ruined the surprise). It’s not just the quality of the Floyd, though, because I think the way that the top is arched is what led to the extreme neck angle which led to the bridge being mounted so high. 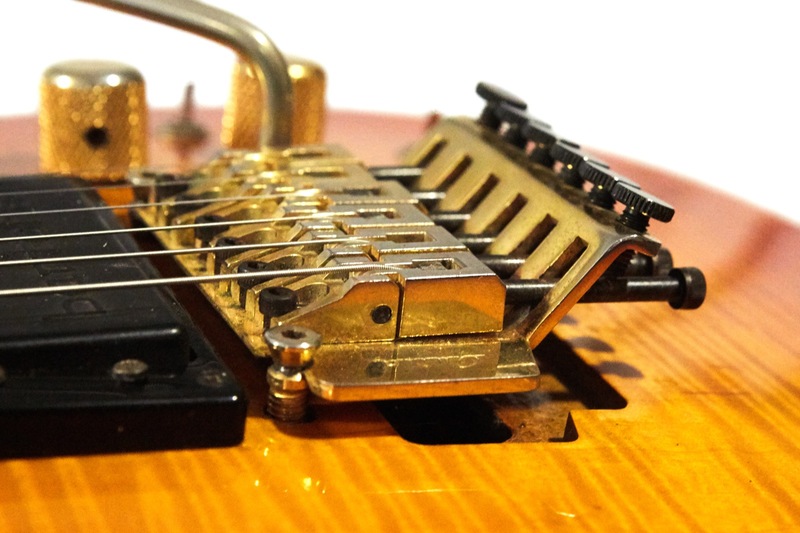 If the peak of the arch had extended farther down to the end of the guitar’s body, then there would have been a continued ridge where the Floyd Rose bridge could have been properly installed. Additionally, with the longer hump on the top of the guitar, the neck angle could have likely been flatter thus also resolving the terrible bridge installation. 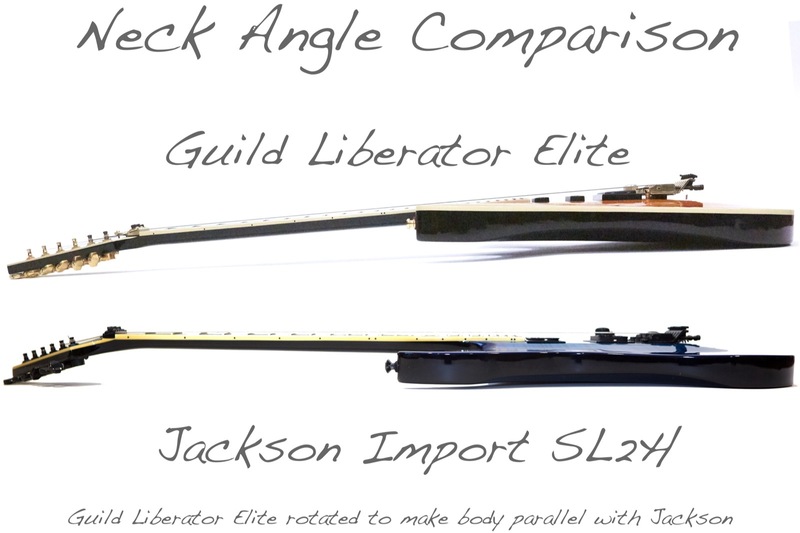 If you zoom in on the two-guitar neck angle comparison pic above, you can see that the Jackson archtop does exactly that: there is a middle hump that goes almost the entire length of the top. To be fair, my ranting about the Floyd Rose may be a bit harsh. We’ll see as I examine that component in the hardware section, but the fact remains that the combination of the bridge itself coupled with the way it is installed in this guitar makes me less than thrilled with the entire thing. If I paid new guitar money for this guitar in 1988 ($1,695, remember) I would have been pissed. I mean, just look at that route. It doesn’t even look like it was made for the right bridge. Hell, the cutout isn’t even useful. If I remove all the strings I have to put something on the finish because the string lock screws dig into the top long before the back of the bridge gets near the route. If I pull the bar up with the guitar strung the block hits the route long before the back of the bridge ever hits the top. It looks to me like the route is for the wrong bridge. Just a quick side-note to my UK readers who may be confused in that last paragraph. In the US, “pissed” means “angry”. The price of the guitar would not have made me drunk, though now that I’m talking about it I want a pint. For my US readers who are confused by the paragraph in the last box, in the UK “pissed” means “drunk”. Talking about the bridge on this guitar gets me all worked up so let’s look at the pickups instead. The pickups in this guitar are absolutely fascinating to me. They are all pretty clearly Bartolinis which is a brand I’d not heard of before buying this guitar. 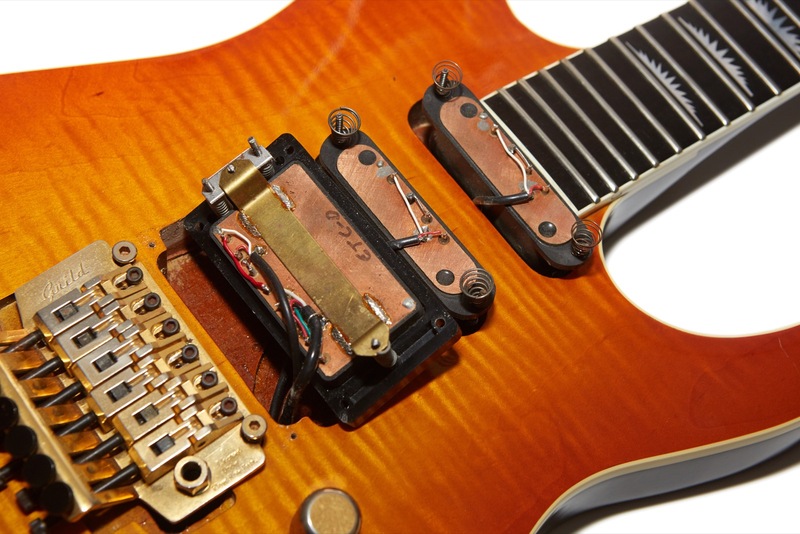 The bridge is labeled ECT-D and has a crazy number of connections on it while the middle and neck single-coil-looking pickups both have four connections on them leading me to believe that they’re some sort of humbuckers. I emailed Bartolini and sent along these pics to see what they could tell me. My conversations with them indicated that the middle and bridge pickups are likely 3XV Fender Strat replacements while the bridge pickup is clearly the ECT-D that later got renamed to the E90-D. The E90-D is listed as “bridge – active dual coil (with E90 coils), high output + boost (9-volt operation only)” on their webpage. 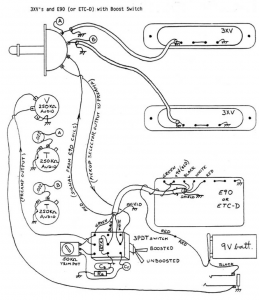 There is not a whole lot of information out there about these pickups, but I did find a couple of documents while rooting though the Bartolini archives including the wiring diagram to the right which is very similar to the pickup wiring and layout in the Liberator Elite except that the Bartolini document clearly shows a normal Strat setup with three knobs and a 3-way rocker switch. 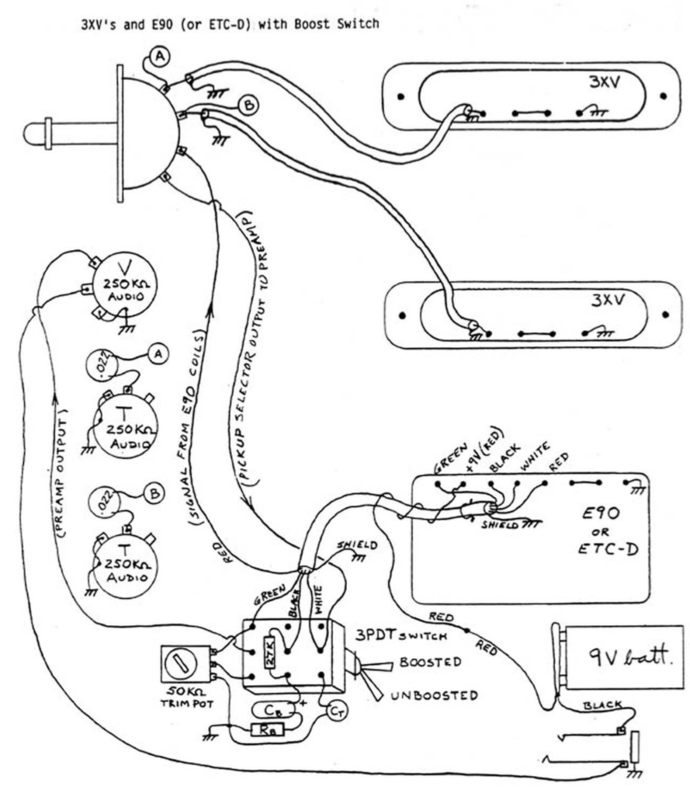 These pickups, after all, were marketed as Strat replacements, so it makes sense that the technical documents of the time show a Strat-like layout. The Bartolini 3XV pickups are “stacked single coils” which I assume means that they are two coils positioned one on top of the other as opposed to side by side like you would find in a traditional humbucker. The both have four connections and I’ll go over every gory detail of the wiring in this guitar in the next section. The pickups all have copper backplates and the covers are sealed making it a likely destructive endeavor to take the covers off. Clearly these are not your normal run of the mill pickups, and they don’t behave like them, either. There were times during my testing where the pickups kind of hurt my head. I mean, they look like single coils and they sound like single coils but they behave like humbuckers and are wired like humbuckers. The fact that I can change the phase of what looks and often sounds like single coil pickups was too much for me to handle, but luckily this is a guitar that’s pretty fun to play so I channeled my angst into abusing the whammy bar with as much gain as possible which always seems to make me feel better. This guitar has some fairly unique wiring and controls. 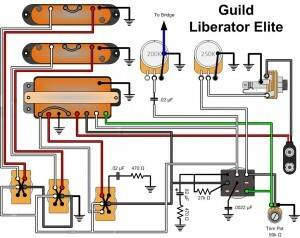 There is no main pickup selector switch, but rather three mini-toggles, each of which controls one pickup with the switches arranged in the same order as the pickups. The additional switch which is all the way to the back and raised a bit from the other three is an active boost which is actually part of the bridge pickup and not a separate circuit (well, it is but it’s built into the bridge pickup’s housing). Since the neck and middle pickups are Bartolini 3XV Strat replacements, they are actually humbucking pickups in single coil sized packages which means that each of them can have its phase switched, which is exactly what those two switches do. In theory they could be coil-split as well, but I’m kind of glad that they weren’t wired for that since I had enough to figure out with the guitar as it is. Each of the toggles are 3-position switches where up is one polarity (labeled (+) in my charts), down is the opposite polarity (labeled (-) in my charts) and the center position is the pickup completely off. 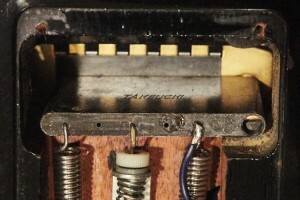 The bridge pickup is a humbucker as well, but it also contains an active boost which is why there are so many wires connecting to it. For this pickup there is also a 3-position switch where up is single coil mode (coil split), down is humbucking, and middle is off. 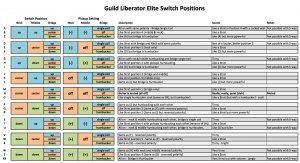 These three switches, each having three positions works out to a dizzying array of options. The math works out to 27 (3 x 3 x 3) possible options for the three switches alone. Add the ability for any of those positions to be normal or boosted with the fourth switch, and all of that combines to make a total of 54 different switch combinations. You read that right: fifty four possible combinations. Oh, and that chart with all the crazy combinations? That only shows the three switches and thus only shows 27 of them. Add the boost switch for 54 because 27 x 2 = 54 in case that’s too much math for you. Now look again and realize that the huge pile of tonal options shown in that table is only one half of those possibilities. 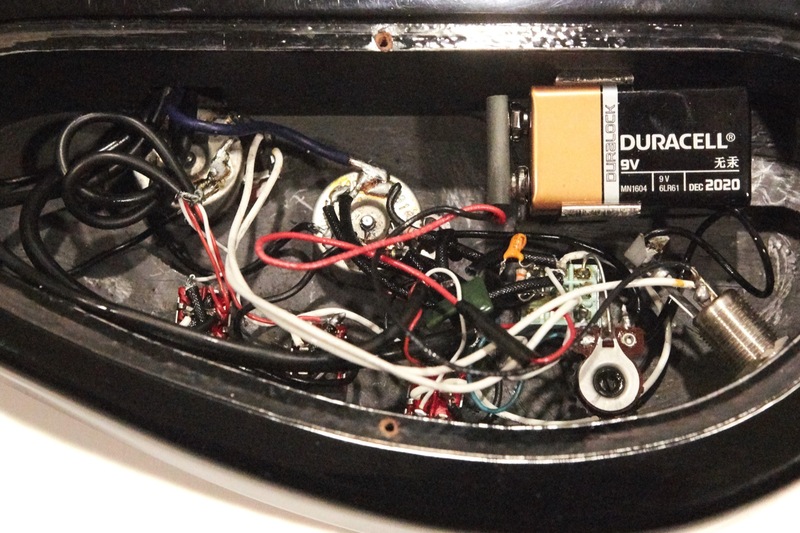 When opening the control cavity cover you are treated to a messy pile of wires which is pretty typical of ’80s guitars that have active components. The output jack was scratchy and intermittent when I got it but some contact clearer fixed it right up. 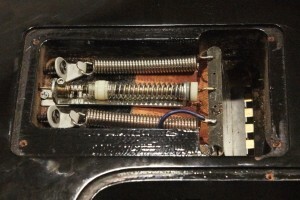 Note that the battery is in the control cavity so the cover must be removed to access it which is likely why one of the corners of that cover is chipped on this guitar. Tracing all of those wires and components was a full afternoon of fun since there is precious little documentation about this guitar out there and even getting information about the pickups was a challenge since two of them are not labeled and the one that is wasn’t even listed on Bartolini’s website. The wiring led to some interesting observations. For example, the output jack is stereo so that unplugging the cable turns off the preamp. 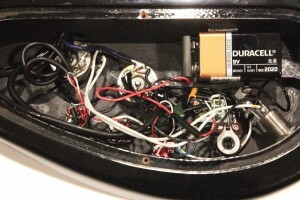 Since the negative lead of the battery connects to the ring and the ground connects to the sleeve (1/4″ phone jacks are tip/ring/sleeve), when you plug in a mono cable it shorts those two leads and completes the circuit. Thus, if you want to preserve your battery, make sure you unplug the cable from the guitar between sets. This possibility of increased use may very well be why the jack was dirty and intermittent when I got it. Inside the control cavity is a trim pot (visible as a white circle on the bottom right of the photo) which allows you to adjust how much increase the boost delivers. Another interesting thing about the boost is that when engaged, it applies to all pickups even if the bridge pickup is not in the mix. This is because all three pickups are in parallel and the boost has its own wiring scheme which is engaged with the fourth toggle. It’s really a very clever design. 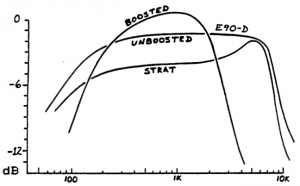 Engaging the boost doesn’t just add volume, it also changes the frequency response curve. In other words, this is not a clean boost and engaging it truly doubles the number of tonal options in the guitar. The Bartolini website doesn’t have any info about the ETC-D, but it does have a document (local backup here) about the E90-D which is apparently a newer name for the same model. 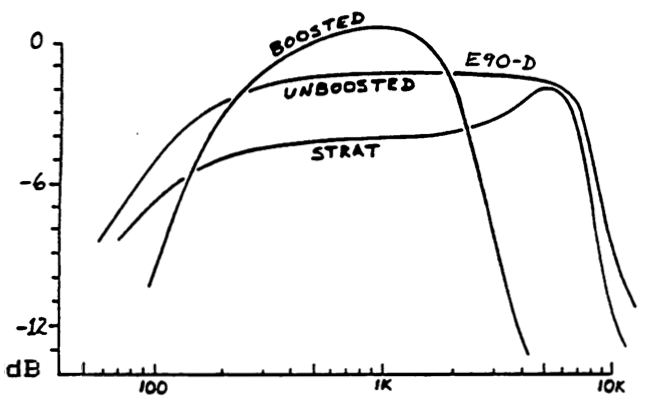 In that document is this graph which shows that when boosted, the pickup actually narrows its frequency response to make it more midrange focused which would help it cut through the mix. According to the document, this is about a 9dB boost over the unboosted mode with the trim pot adjusted to the middle of its range. 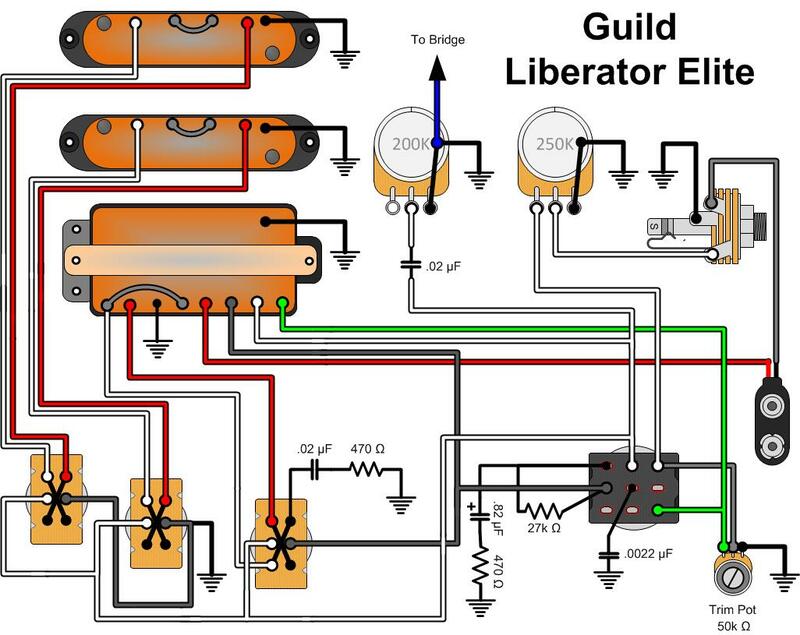 There is no word in the document about how and if the boost affects other pickups in the circuit, but given the way the pickup coils are wired separately from the boost, it stands to reason that it would affect them similarly and play-testing the guitar bears this out. Note that some of the many switch variations produce the same results. For example with the neck and middle pickup switches both up, it sounds like a Strat in position 4. With those same two switches both down you get the same sound because you’ve reversed the phase of both pickups which nets the same result. Similarly, if you reverse the phase of one of them (up/down), you’ll get the same sound if you reverse the switches (down/up) because you’re producing the same result (out of phase pickup) but you’ve reversed both of them. As a result there aren’t truly 54 tonal options, but filtering out the duplicates was too much work for me to care about. The tuners are gold plated Guild-labeled affairs probably may by Gotoh and that’s the last nice thing I have to say about the hardware. The knobs are at slightly odd angles because they were installed at a 90° angle to the top on an arched-top guitar. Most arch-top super-Strats have indentations in the top for the knobs so that they stick up straight. Not so here. The knobs are really a minor quibble, though, and the knobs themselves are nice enough. This is a top-of-the-line high-end guitar that’s got class and style written all over it. This guitar could have put Guild on the map right smack dab in the middle of the Super-Strat revolution that was the ’80s and right at a point when Guild could have really used a winner. Sadly, Guild just never seemed to figure out that segment of the market, though they sure did try, and to be fair some of Guild’s other offerings of the time did do pretty well. The only hardware left to talk about is the bridge. On this magnificent looking flagship guitar that’s proudly stamped “Made in the USA” on the back of the headstock, the Floyd Rose is an import licensed piece of crap. The installation is almost horrifying in how wrong it looks, and when I pulled it out of the case and tried it for the first time it squeaked. So help me, it squeaked! To be fair to the import Floyd Rose on this otherwise beautiful instrument, it wasn’t the bridge that was squeaking. If you’re not familiar with shred guitars that have double-locking floating trems, they can do some wacky things. For example, when bending strings you’re putting more tension on the bridge and when the bridge floats, this can pull the guitar out of tune for the duration of the bend. If you wack on the arm of a free-floating trem, it will “flutter” which is an effect used by the likes of Steve Vai while he’s busy otherwise abusing his guitars. To “fix” this and other “issues” a Hipshot Tremsetter was installed at some point in this guitar’s past. The Hipshot Tremsetter is not known as the best solution today where there are a myriad of other solutions, but there was a time where the Tremsetter was the only solution, and my guess is that it was during this time when it was installed. The Tremsetter makes the floating Floyd Rose feel kind of like a double swinging door in that there’s now a noticeable sort of detent in the resting position that’s not normally there. This detent (for lack of a better word) helps to keep the guitar in tune when bending strings and it reduces the tendency for the bridge to flutter when you don’t want it to. Long story short: I lubricated the crappy Tremsetter and the squeak went away, but it did not make me any happier about the bridge or its installation. 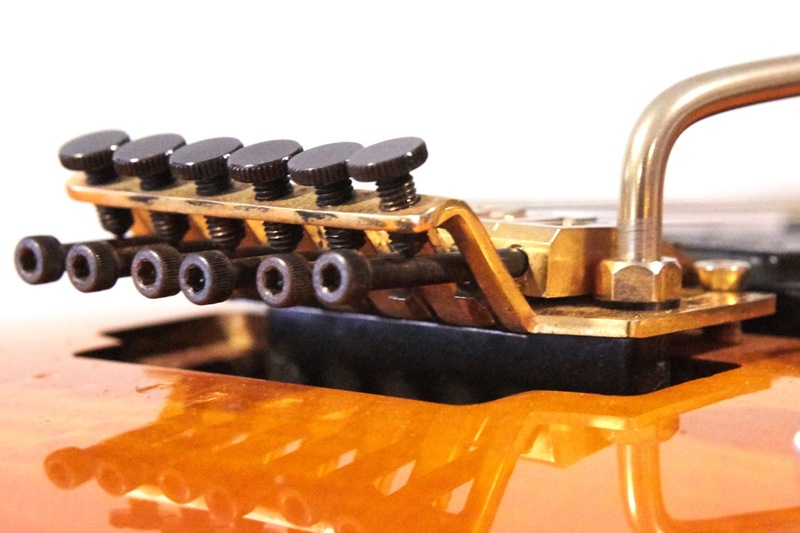 Honestly, my gut reaction to the entire bridge is to yank it and replace it with a quality Schaller or Gotoh Floyd Rose. I don’t know if this is a preference of a previous owner or a byproduct of the Tremsetter, but the Floyd Rose is really stiff on this guitar. It feels like it has 100-pound springs in it in addition to the Tremsetter-induced detent. As you may have guessed by now, I am not a fan. I rant and rave about the “import piece of crap” Floyd Rose, and that may by my ’80s guy bias showing. From what I can tell this is a Takauchi TRS-101 Licensed Floyd Rose which was made in Japan and is probably about the best of the import Licensed Floyd’s of the time. 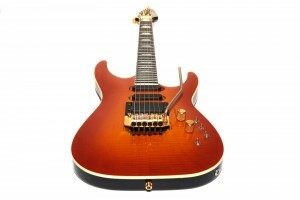 This model was pretty commonly used on import model guitars from Charvel, Washburn, Ibanez, Yamaha, and others. Hell, my Jackson SL2H is an import and likely has a Takeuchi Floyd Rose on it but it looks nicer because it’s finished and installed better. Way better. The arm on this Floyd Rose had a fair bit of corrosion on it and I needed to give it a rubdown with 0000-guage steel wool to make it feel smooth again. Additionally, the shape of the arm is kind of odd to me which, when combined with the obnoxiously high installation of the bridge, makes it seem like the entire arm is floating about 14 inches above the guitar. 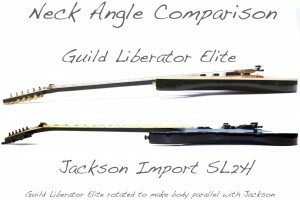 This is illustrated by the picture showing the Guild Liberator Elite as compared to my import Jackson SL-2H. 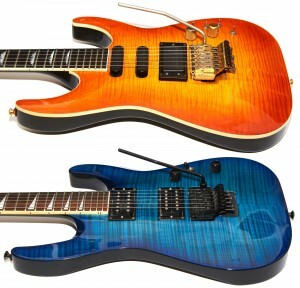 Note that the very tip of the arm seems to be in about the same position on both guitars, but the Jackson’s arm bends much closer to the body then slowly ramps up while the Guild’s arm goes up about an inch then bends. This causes more of the bar to be higher above the guitar which, to use my favorite technical description, is icky. 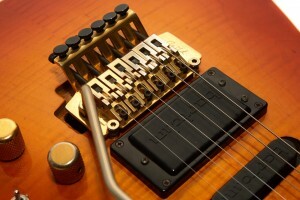 Note also how nicely the import Floyd Rose is installed on that import arch-top Jackson. One of the first things I do when I get a Floyd-Rose equipped guitar is go to fu-tone.com and order a big brass replacement block. They don’t seem to have one for this bridge, but if I really wanted one I found one over at Killer Guitar Components (link). 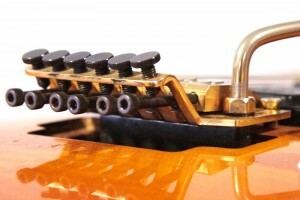 Note that the block on these is a little different than many Floyd Roses out there because the arm actually screws directly into the block as opposed to there being a locking nut on the arm that connects to the bridge. Really, though, if I’m going to go through the trouble of pulling the bridge in order to replace the block, I’m going to replace the entire bridge. Sadly, doing so won’t correct the bridge’s height problem. Have I mentioned how high the bridge is mounted off of the top of the guitar? Because it really is stupidly high. What’s worse is the fact that it can’t be lowered because of the neck angle. With the bridge positioned as you see it in these pictures, the strings are very low on the neck, almost to the point of buzzing. The bridge has to be this high in order to clear the neck because of its 5.5° angle. This is not the bridge’s fault, but rather whoever designed this guitar’s neck and top geometry’s doing, and as you may have guessed by now, I don’t like it. Let me make something absolutely clear, though: The bridge functions as it should. I’ve spent hours with this guitar doing dive bombs, flutters (barely), Dimebag squeals, the Mötley Crüe chopper sound, and the ol’ Satriani/Vai Lizard Down the Throat trick all without the guitar skipping a beat. The things I am complaining about regarding the bridge and its installation are, for the most part, cosmetic and not functional. The guitar is built strangely, but it’s built well and plays well. Given the alternative of a guitar that looks great but plays like crap, I’ll take the Liberator Elite every time. Still, I’m here to give an honest review and honestly, the Floyd Rose looks like crap. 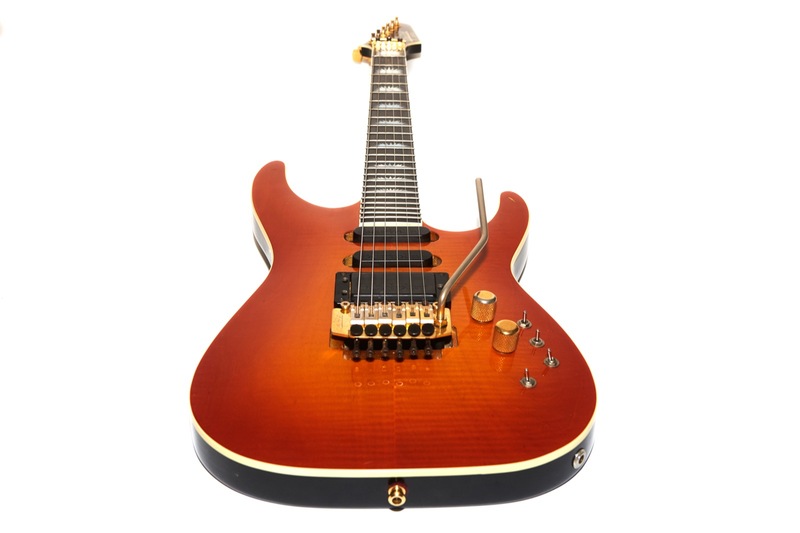 OK, I’m done complaining about the Floyd Rose and the neck angle on this otherwise amazing guitar. So, how does it sound? I mean, it’s got 54 possible tonal combinations so there’s got to be at least a couple of gems in there, right? This guitar is so freaking versatile that I imagine the average guitarist setting maybe two or three killer tones and forgetting all the rest then swearing vehemently when anyone touches the switches. This thing will go from the sweetest, chimiest straight-up Strat tones to the hardest of the 80’s metal hair band triple-rectrified shred metal with the flick of, well, of up to four switches depending on your previous setting. In fact, that’s one of the guitar’s downsides: it has so many tonal variations that remembering them all is a practical impossibility. Looking for a Dire Straights quack? Can do! Stevie Ray Vaughn? Sure thing. Mötley Crüe? Yup. Dokken? Yes. Humbucker neck tones a-la Gary Moore? Yes. Out of phase middle position humbucker Peter Greene tone? Sure. The problem is that in order to show you how I’ll need to grab my flowchart, and that actually brings me to my next dilemma. Normally, when recording a guitar, I sample all of the possible tones with the knobs all on ten. In order to do that with this guitar I would need to record 54 samples on each amp setting. Ain’t nobody got time for that! Seriously, though, that’s a lot of options. So what did I do? I recorded them all, because that’s how nutty I am. 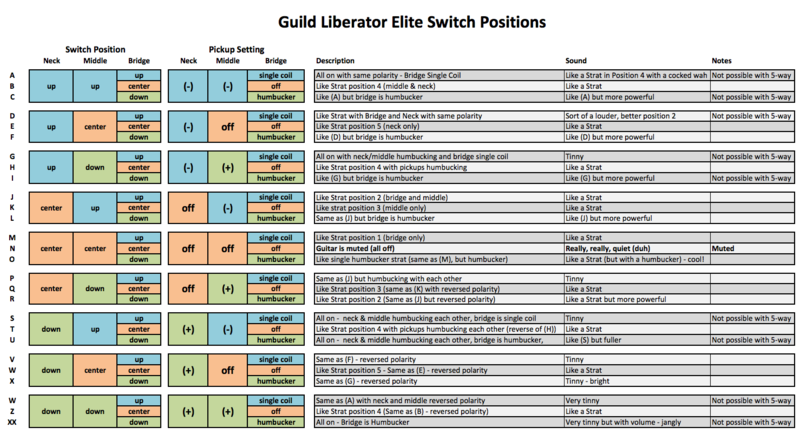 Hey, if you came here to read about a Liberator Elite, then you probably want to know what all the damn switches do. In a nutshell, this guitar sounds best to me either clean or with high-gain distortion. That great bluesy edge-of-breakup sound doesn’t seem to work too well on this guitar which my non-scientific gut is blaming on the pickups and maybe, just maybe, the poor installation of the bridge. People say that Bartolinis have a hi-fi sound and then usually argue for pages about what that means. Thinking about it, I think there’s not a lot of dynamics coupled with a very flat response curve which means they can sound compressed and uninspiring if you’re looking for traditional Les Paul or Stat tones. While I think you can get a great variety of tones, you might have to work a bit for them. A case in point – imagine all of those tonal options I already talked about (54), and now add the variables of the tone and volume controls. Some of the settings sound better with the volume rolled back to eight. Some with the tone rolled to seven. Some with both rolled back. Holy crap that’s a lot to remember. People also seem to comment that these pickups (and I hear this comment about EMGs as well) are “good for recording” or “good for rack gear”. I think this is the same argument which is really describing the relatively flat response across a wider than normal range. Look again at the frequency response graph. Unboosted they have a slightly wider response than Strat pickups but a much flatter more even frequency response which is not what people expect from a guitar. Oddly enough, that wide/flat curve makes them warm and chimey which is not usual in traditional guitar pickups and as we all know, if there’s one thing guitarists don’t embrace well it’s new ideas. Additionally, some of the pickup selection options just don’t sound good. If you don’t like the two humbuckers out of phase sound, then there are a number of tones in this guitar that you’ll just flat-out hate. Still, if you’re clever with amps and effects and modelers and such, then you may be able to invent some cool new tone, and that’s why I think people say they’re great for rack hounds. For these recordings I tried something new and recorded my new Axe-FX II XL+ direct via USB which worked mostly OK, though you’ll here some artifacts in there thanks to computers sucking. Because this is direct there is no Olympus LS-10 or QSC-K12 in the mix, but instead the pure digital signal including all cabinet modeling on the new Axe-FX. Tiny Tweed is no longer a patch on the new rig, so until I can recreate what I had, I just recorded using the stock JCM-800 patch and the Brown Sound patch which is designed to be pure ’80s Van Halen. Both of these recordings were done with the bridge pickup in humbucker mode and the boost turned on. The single coil pickups were off. My normal selection of recordings is not here because a) the new Axe-FX doesn’t have a bunch of the patches I normally use and I didn’t move them over and b) the number of settings on the damn guitar had me stumped. What to record? My normal set of recordings would take me about six months to get through if I recorded all 54 possibilities! This entire article has been done for weeks and was just waiting on sound files so finally I just decided, “screw it”, sat down, plugged everything together and recorded whatever I felt like. If there’s something you’re dying to here let me know and I’ll see about recording it. 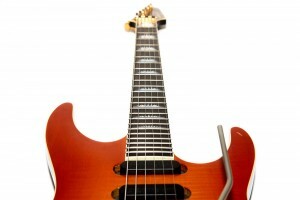 Considering my gripes about the neck angle and Floyd Rose installation, do they affect playability of this guitar? Not really, though if I concentrate on the neck angle then it bugs me for no other reason than it’s different and I can’t figure out why it’s like that and once I decide to take the time I’ll rip out the Trem-Setter and tune it to my preferences. From a playability standpoint I don’t like how stiff the Floyd Rose is, but I can’t blame the guitar because I have no idea of it was originally like that. Yes, the bridge is stupidly high, but I rest my picking hand on the bridge anyway, so my picking is not really affected by this. It is possible that the guitar my bother my wrist after long periods of playing since the bridge is so high, but having had two surgeries on my right arm due to nerve impingement problems, I’m pretty sensitive to those types of issues and usually notice them right away and I’ve played this guitar for over an hour without it bothering me. As a completely random comparison, I can’t use the track pad on a MacBook Pro for more than five minutes without my hand going numb. It was another hour-long session where I noticed that the Floyd Rose itself was getting in my way when strumming. Because the bridge is so damn high I’ve found myself knocking my hand into it during some crazed strumming or maniacal picking. My right hand hit the row of fine tuners a couple of times which has never happened to me on any of my other Floyd-Rose equipped guitars, probably because they don’t stick up so high on my other guitars. The guitar is shaped like a Strat so it behaves like a Strat. Well, mostly. With the severe neck angle it’s almost like a Strat that curves around your body so in theory it’s easier to reach the far frets, but in reality I find that while standing I orient the guitar around the neck and not the other way around, though that’s me overthinking things and looking for issues. In reality I strapped on the guitar and went to town. 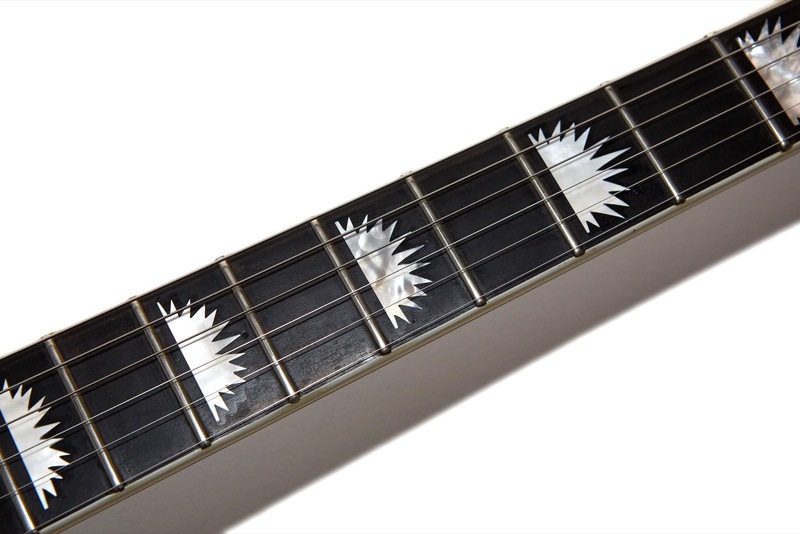 A 5.5 degree difference over a long scale fretboard is not that noticeable unless you look down. Don’t look down. One thing that I didn’t expect to be a problem was quick changes of the pickup settings. On a Guild Bluesbird, for example, I slam the pickup selector and go to town because slamming a big pickup selector toggle is a gross motor skill that I can do mid-strum. Finessing four tiny toggles is a fine motor skill that makes me stop and look at the guitar so I can’t just do it without thinking. The good news is that all of the switches are well out of the way and behind the knobs so I don’t hit them while playing which is one of my biggest complaints with a traditional Strat. My other complaint with normal Strats is that the middle pickup gets in my way when playing which is no doubt as a result of me playing a dual humbucker guitar for 20 years. That’s the reason that I like archtop super Strats – the arched top seems to solve that problem for me and I’m happy to report that this is mostly the case with the Liberator Elite as well. Finally, this particular guitar has some fret issues because the high E string gets stuck under the fret ends during bending. Of course, this is an old guitar and may have suffered some shrinkage over the years and the frets likely need work, but I think the strings are just a touch to near the fretboard sides as I find myself slipping the low E string over the side from normal vibrato as well. Normally my reviews of Guild guitars are maniacal fan-boy ravings and this one has a fair bit of ranting about things like neck angles and terribly installed import Floyd Rose systems. When it comes right down to it, though, I really dig this guitar, annoying design issues and all. I’m a guy that loves a Floyd Rose but the installation of the bridge on this guitar is just stupid. It does, however, work so I guess it could be worse. Annoyances aside, this is guitar is a blast to play in part because its a high end instrument and in part because of the ridiculous number of tones that you can pull from the pickups. It’s also fun because the pickups are so unique. Speaking of unique, this is not a guitar that you’re likely to see often. I mean, if you showed up to the battle of the bands with one of these slung over your shoulder, the likelihood of the competing band’s guitarist also having one is practically zero. The flip side of that equation is the fact that it might be hard to replace a pickup should one of them fail. Luckily we live in a world where eBay and Reverb exist to solve that problem. 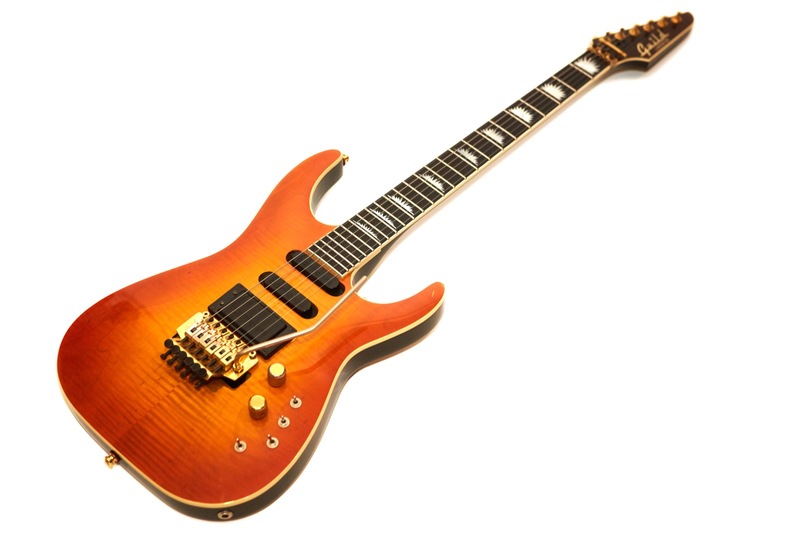 This guitar doesn’t get the “OMG it’s a Guild go buy one!” award from me because, well I think you know why by now unless you skipped to the bottom in which case let me sum it up for you: the Floyd Rose installation is crap because of the severe neck angle but it plays fine anyway. I think this is a guitar more suited to collectors than it is active players, and if you happen to be a collector that’s an active player, well then good luck finding one of these rare beasts unless you’re Grot, in which case you’ve already got one. Also, you can’t have mine. That’s the real review in a nutshell: It’s not perfect by any stretch, but I love it anyway. If only Guild had managed to keep it together for a couple of years and come out with a Liberator Elite II. Man, what a guitar that might have been. Thank you thank you thank you. I’m a guitar tech in Portland, OR and a client just brought me a Liberator Elite. First thing I noticed was that neck angle!!! And the electronics are a bit iffy but thanks to this amazing write-up, I know what they should do. Thanks again! Let me get this straight…waaaa,waaaa,waaaa, bridge. Waaaa, waaa, neck angle. Waaa, waaa waaa, bridge. Beautiful! Waaa, waaa, waaaa bridge. Plays great! Sounds great! Waaa, waaaa, waaaa, bridge and neck angle. Great guitar! LOL. That sums it up nicely. How yeah, my 87 Soloist had the 3 on/off switches too, pain in the neck.